Whip up this tasty, fast, easy mayonnaise recipe once, and you may never go back to store-bought. The first time I realized that mayonnaise could be made at home I was reading Chapter I, De Gustibus (regarding taste) in Craig Claiborne’s New York Times Cookbook. His recipe called for an egg yolk, salt, freshly ground pepper, Dijon mustard, vinegar or lemon juice, one cup of peanut oil and a whisk. I tried it and to my amazement, it worked! The chemistry in forming this emulsion is visually fascinating. But what a lot of effort. I was happy enough with my jar of Hellmann’s. It would be 27 years before I’d have another go at the homemade version. In fact it was Barbra who encouraged me to revisit mayonnaise. Taking up her challenge, I made a cup of it, this time in a blender. Better than getting mayonnaise elbow with a whisk, but still… the old-school blender I used was a bother to clean. So the next time we needed mayonnaise, we went to Point Hope’s Native Store. $$$ for a six-ounce jar. That was when we decided, finally, to invest in a good immersion blender – aka a stick blender. And now, I doubt we’ll ever buy a jar of mayonnaise again. The recipe below is quick, easy to clean up after, and results in a tasty, preservative-free, all-natural mayonnaise ready to be spread on a turkey sandwich, to serve as a base for anchovy-mayonnaise salad dressing, or to blend into deviled eggs. You will need a stick blender and a fairly narrow container such as a small canning jar, one just wide enough so that the stick blender fits. Place egg in a narrow jar or other container. Add lemon juice, vinegar, mustard, salt and pepper. Push stick blender to the bottom of the container. Blend on high speed. (This depends on the blender. Ours gets the job done at a lower setting.) Within seconds, mayonnaise will start to form. As soon as you see this, gradually raise the blender to create more mayonnaise. Mix through top to bottom one more time thoroughly. The entire mixing process will take about 10 seconds. This mayonnaise will keep in your refrigerator for about two weeks. The extra virgin olive oil and the Dijon give it a distinctive taste. 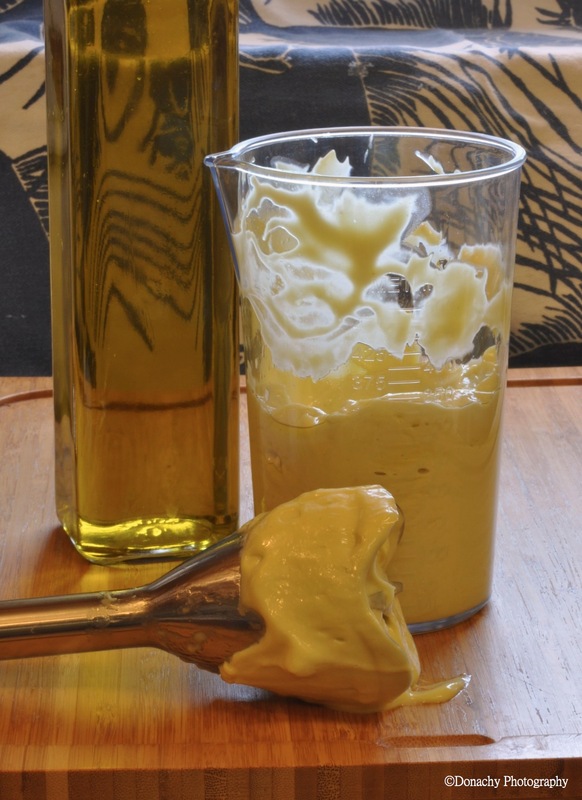 For mayonnaise more like commercial brands, use canola or peanut oil and half the Dijon or a milder mustard. Growing up, soup usually meant opening a can of Campell’s. Their Manhattan clam chowder was my favorite. When I got out of the navy and began cooking for myself, Craig Claiborne’s Manhattan Clam Chowder was probably the second recipe I attempted – right after his chili recipe. The results were a revelation, and I never went back to Manhattan from a can. Generous amounts of thyme, tomatoes, onions, potatoes, clams, carrots, celery, and a hint of heat from red pepper flakes keep this recipe close to the spirit of Claiborne’s, but with the addition of corn, green beans, and chard it strays from tradition, although I doubt the Portuguese immigrants who introduced this style of chowder would object. The smoked sea salt gives this soup a hearty warmth. This recipe makes about 3 1/2 gallons. Chopping up all these ingredients is a bit of work. After that the cooking is pretty standard. 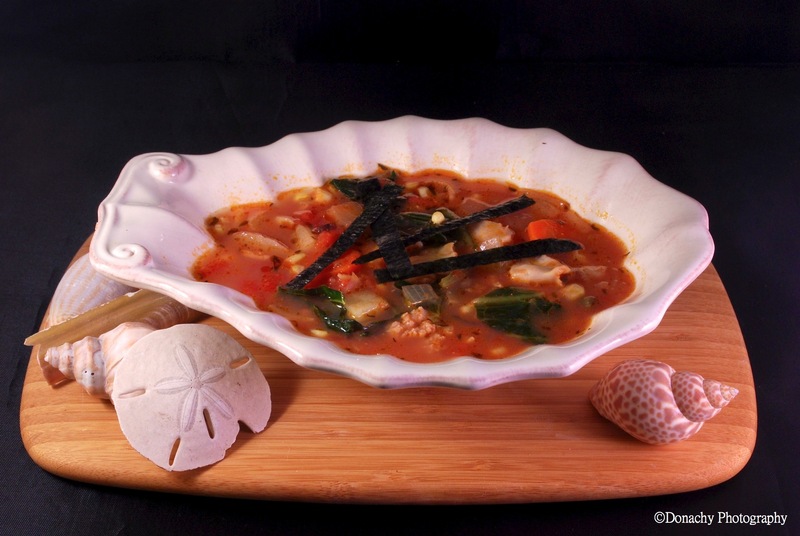 This chowder freezes well and allows for many substitutions – including substituting a white-meated fish for the clams, or adding mussels, shrimp, squid, octopus, etc. 2. Cover the bottom of a large pot with olive oil and heat over medium-high. Add the carrots and cook for a minute stirring occasionally. Add the onions and cook for two minutes, stirring occasionally. Reduce heat to medium and add the celery, green beans and garlic, stirring occasionally for about three minutes. 3. Add the diced tomatoes, the tomato sauce mixture, the potatoes and remaining seasonings. Add enough water to cover the potatoes and simmer until soft. If the soup seems watery, add more tomato paste. Stir occasionally. Depending on the type of potato and size of cubes, this takes 20 to 50 minutes. 4. When the potatoes are of desired softness, stir in the chard or collard greens. Continue simmering for about 2 minutes. 5. Stir in the sweet corn, the clams and the clam juice. The corn will add considerable sweetness, as will razor clams. Give it a taste to see if it needs more salt, pepper, chili flakes or thyme. Don’t overcook. As soon as the clams and corn are heated, the chowder is ready to serve. Garnish individual servings with a very thin slice of lemon, a few strips of nori, or grated parmesan cheese and serve with a hunk of crusty, fresh-baked bread. An original caribou antler and walrus ivory carving by Edwin Weyiouanna guards a bowl of bowhead whale stew. Outside it was -11 degrees Fahrenheit. The steady 25 mile per hour wind brought the chill down to negative 40, making it a good day to stay inside and cook a big pot of comfort food. I could feel the frigid north wind seeping in around the edges of the window over the kitchen sink as I stared apprehensively at the three, one-pound cubes of thawed whale meat draining in the stainless steel basin. The odor of the dark red meat was decidedly un-beef-like, but it was mild and agreeable nonetheless – not at all gamey or fishy. The texture was a bit like that of fresh halibut – soft and dense. The meat of the bowhead whale, the largest genus of right whale, might be compared to especially tender filet mignon. I had no idea what cooking would do to the texture, or what the meat would taste like. “Good beef,” I hoped as I rinsed the meat and considered my next move. For the past 27 years, Craig Claiborne’s The New York Times Cookbook has been a faithful companion – my go-to reference when I’m not sure what to do next in the kitchen. 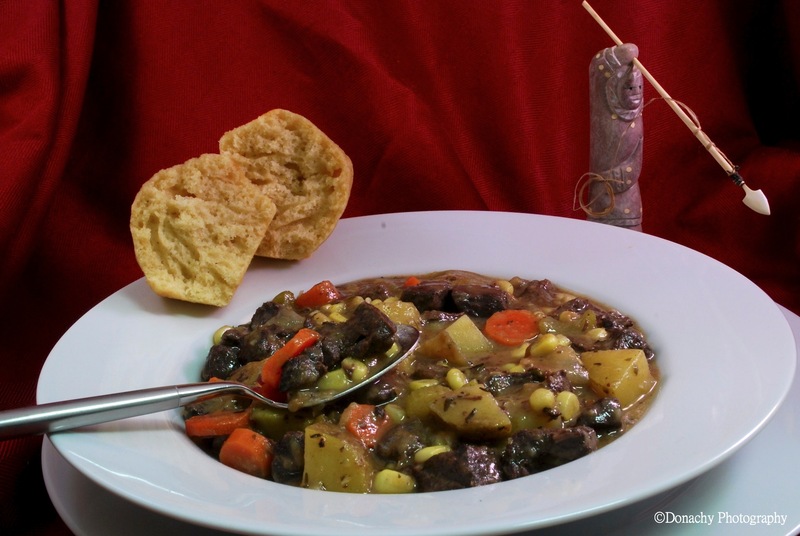 I turned to Claiborne’s basic recipe for beef stew, made a few modifications to take into account what we have on hand and our own tastes, and proceeded from there. The end product was probably the best meat stew we’ve ever had (allowing for the fact that our creation would have been improved with the addition of three cups of good red wine, which is, of course, unavailable up here.) The meat was wonderfully tender and no more strongly flavored than, say, strip steak, and complimented the seasonings and other textures in the stew beautifully. I served three piping hot bowls of stew with freshly baked cornbread muffins while daughter Maia cued up the film The Triplets of Belleville on our big movie screen – the perfect recipe for staying warm north of the Arctic Circle.